Badcock Home Furniture began in 1904 when Henry Stanhope Badcock, an immigrant from England, started his first store in Mulberry Florida. In 1920, Wogan, Henry’s son, bought the Mulberry store from his father. 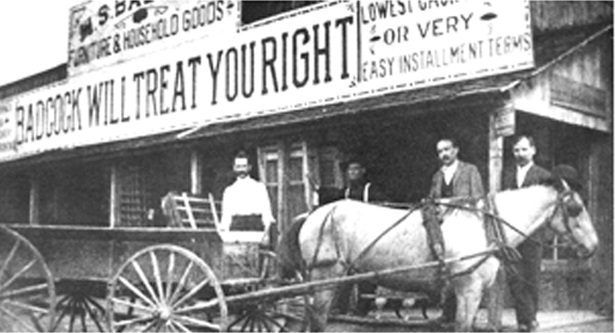 Business grew and prospered until 1928 with the land boom/bust. It became very difficult to sell the merchandise Wogan had on hand. It was during this time that he developed the concept of the Dealer operation. He initially put merchandise on consignment in various stores throughout central Florida and agreed to share the proceeds if and when the merchandise was sold. He began selling merchandise through route salesmen who used small trucks to travel designated routes and sell to customers on credit, collecting on installments. Over a period of time, the salesman’s routes along with the consignment of merchandise to other stores developed into the establishment of home furnishing centers to receive and sell only merchandise consigned from the W.S. Badcock Corporation. The Dealers were able to finance their accounts with support from the corporation. The principal of granting credit to customers was relatively unique at that time and was really the forerunner of the way most merchandise transactions are conducted today. In late 1999, the corporate image “and more” took on a whole new look and design. The traditional blue and orange logo of the 1960’s was replaced with the logo that stands today. The Badcock & more Store 2000 Conversion Project launched, featuring new storefronts and an interior re-design. On March 7, 2000, the first Badcock & more retail store built from the ground up celebrated its ribbon cutting in Dade City, Florida. In 2013, Badcock & more began working on the next refresh of stores, featuring new floor plans, interior color, and a sleek new identity wall. With input from a lot of loyal customers, Badcock & more’s focus is still on offering customers great and easy financing options with our own in-house financing, but is also on providing customers with the color and style they want, at prices they love, in an atmosphere that is allows them to picture the furniture in their own home. Today, there are over 300 Badcock & more stores in eight states: Florida, Alabama, Mississippi, Tennessee, North Carolina, South Carolina, Georgia, and Virginia. There are approximately 75 corporate stores and 240 Dealer-owned stores. 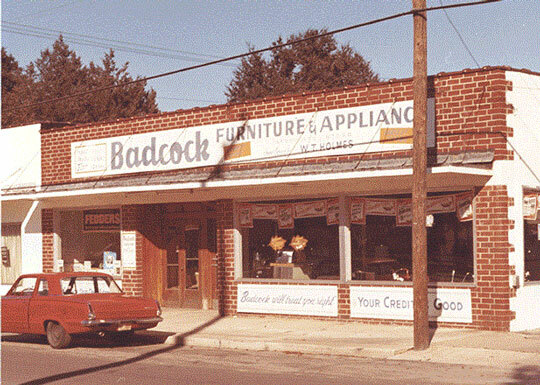 In November of 1951, James C. Baber, Jr. was offered the chance to buy the Badcock store in West Palm Beach under his own Corporate name, Badcock’s Economy Furniture Store, Inc. And thus, the Badcock South Florida branch was born! Despite their independent operations, both the companies use the trade name of “Badcock Home Furniture & More”. Due to back to back hurricanes in 2004, the South Florida Corporate headquarters was destroyed in West Palm Beach and moved to Palm Beach Gardens, Florida. The Company has since then grown to 11 retail stores, a distribution center in Pompano and employs over 200 people throughout South Florida.